Originally born in France, Annabelle Josse moved to Australia in 1997 and currently lives and works in Sydney. 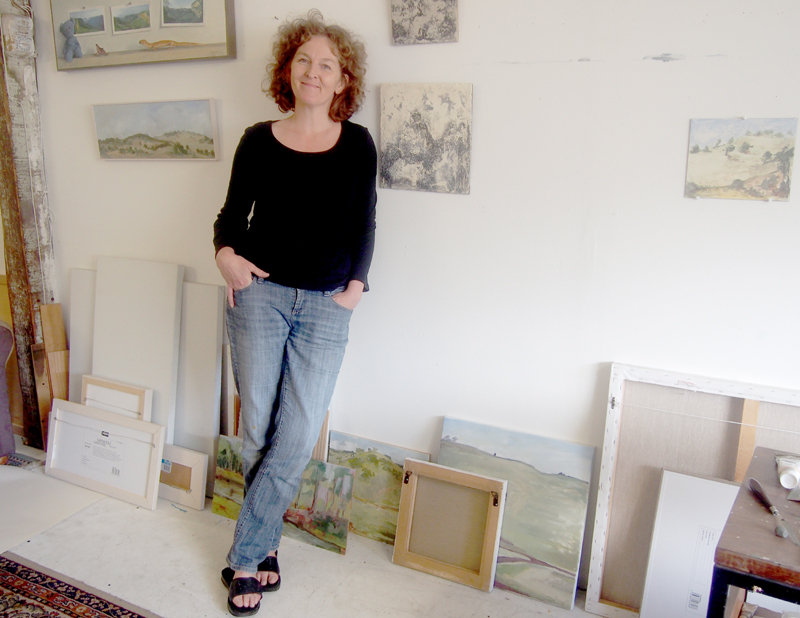 Primarily a painter, her art practice is strongly influenced by the landscape. For the last 2 years, I have been working on a series of painting featuring postcards that have been given to me or sent by friends. 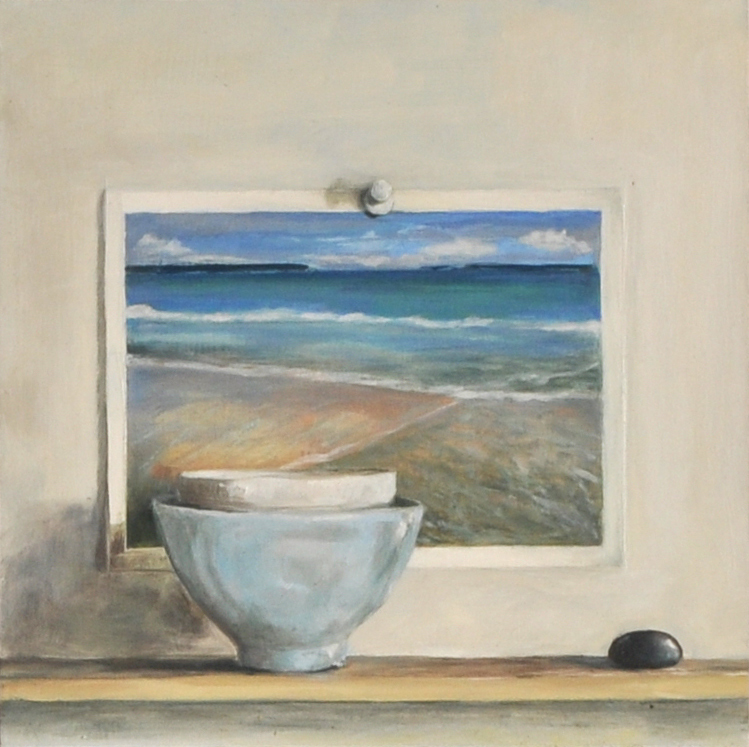 The postcards are placed in a still life composition together with objects of significance that illustrate my relationship to the person who has sent the postcard. The paintings are generally small and placed in large dark frames that lead the viewer into an intimate visual space. More recently the series has evolved to include larger compositions gathering collection of landscape postcards on a specific theme. CAN YOU DESCRIBE YOUR ART PRACTICE IN RELATION TO THE LANDSCAPE? What is you medium of choice (if any) and how does it influence your work? It varies really. I use oils a lot. But oils are difficult outdoors so I often draw or use gouaches / watercolours when painting en plein-air, then work in oils back in the studio. Having said that I want to take my oils outside so I am investigating how to do that practically so I can do more of it in the near future. What is your preferred exposure to the landscape? plein air? residencies? memory? I most preferred the outdoor. That’s were I feel most connected. I feel alive there. I think when I am outdoors, I am in symbiosis with the subject. I helps me forget about me as an maker of art, forcing me into the work itself, the famous “flow”. For the Postcard series, I have worked in the studio because of familial and financial constrains and that had a significant stylistic effect. The paintings are more constrained, realistic and static. I am getting tired of it. 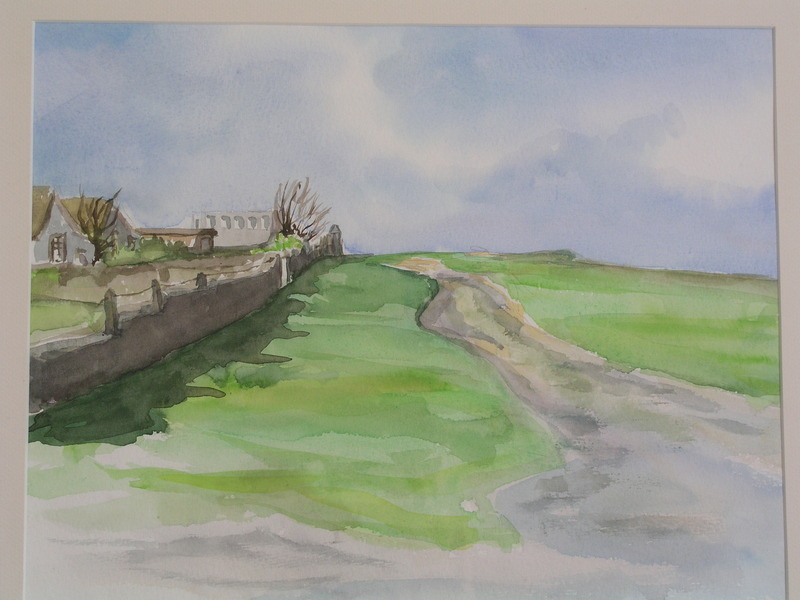 I am craving painting loose again..
Do you use photographic material? I do take a lot of photos, but they work best for me as a support for memory when I work from a landscape that I have captured first in gouache or watercolor or a a drawing as this one carries the initial emotion. The photos are generally cold and distant. I find it difficult to feel from the photograph only. WERE YOU ALWAYS A LANDSCAPE PAINTER OR HAS YOUR PRACTICE EVOLVED TO COME TO IT AS A CENTRAL ELEMENT? I think I have always been mostly a landscape painter. I do digress in the occasional still-life or interior but my heart vibrates for the landscape…. COULD YOU DESCRIBE YOUR BACK GROUND AND EARLY YEARS (childhood, development to being an artist)? I was born in France, in Normandy. I think my attraction to visual art was sparkled by my grand-mother: she married a farmer and spent her life working the land so she wasn’t especially an artist but she had received an education that included tuition in embroidery and drawing. In her late years she was living in an apartment and had beautiful charcoal and pencil drawings on her walls that she had produced as a adolescent. She also had a few classical oil paintings. I still remember spending hours contemplating them on the walls, admiring the technique and the beauty of the lines and shadows. I can still visualise them very clearly. I use to draw all the time as a child. While in high school, I went to evening art classes at the local art school and studied classical drawing, chalk pastel drawing, pottery. Unfortunately I did not have the courage to stand up to my parents who preferred a career as an engineer for me but even during my Uni years I manage to keep attending art classes everywhere I was. I also loved to paint outdoor, mostly in watercolors. DO YOU THINK THERE ARE SOME CHILDHOOD ROOTS TO YOUR LOVE OF LANDSCAPE? I have always loved being outdoors and my father imprinted an admiration for spectacular views early on! During our family holidays we visited many of the French provinces. On the way there, dad would always find the best picnic spots with the best view so we could eat our sandwiches in awe of the magnificence of the landscape. He would leave the highway and take small side roads, sometimes driving for up to an hour before we were allowed to stop for lunch. We used to hate it (the wait for lunch break) but I know it formed my first admiration for the natural world…. unless it is just the Pavlovian reflex of the food reward finally being delivered at the same time as the nice view! I grew up in a medium sized town near the sea (50000 people) and later moved to a small village (200 inhabitants) as my parents bought an old farm in the country. I was about 12 then and started riding my bike in the countryside, spending afternoon on my own and I remember feeling incredibly moved by the changes in light depending on the time of the day and the seasons. The sky in particular is very changing in that part of Normandy and is generally charged with numerous clouds that alter the light significantly. I think that is when I developed a very melancholic connection to the land. DO YOU HAVE A SPECIAL CONNECTION TO THE AUSTRALIAN LANDSCAPE? How? Why? I am still unsure about the nature of my connection to the Australian landscape. The nature here is so rough, so harsh. I find the Australian landscape terribly unfriendly, almost hostile. When I travel to the bush, I have these flushes of mild fear rising to consciousness and I am not sure I really like it. At the same time, the Australian landscape possess this primal characteristic, that permanence, as if it had always been and will always remain, and that makes me feel very mortal, fragile, temporary. I had never felt that way in the landscape before coming to Australia. HAVE YOU TRAVELED & USED OVERSEAS LANDSCAPE AS A SOURCE OF INSPIRATION? how did this influence the work? Besides France and Australia I have not traveled in other countries where I stayed long enough to be significantly influenced by it in my work. I would love to do so though. I am planning to go back to France and spend a few months there. It will be interesting to see how I re-discover my home land then. WHERE DO YOU LIVE? DOES YOUR USUAL LOCATION AFFECT YOUR PRACTICE OR HAS IT BEEN CRITICAL IN THE EVOLUTION OF YOUR ART? We live in Sydney, in the city. I have found it difficult to renew my inspiration, my mental stock of emotions over the past few years as my exposure to the country has been restrained by external factors. I have had to find a way to work around these physical constrains by starting the postcards series. I have re-injected the emotional charge by working from postcards of people who meant something to me, by choosing these objects that crystallized my feeling for them. WHAT ARE YOUR INFLUENCES (other artists) and why? Denis Hopper and Clarice Beckett: I respond to both there interpretation of the light and the melancholy of the works. There is an intense feeling of solitude and isolation in their work. I also admire Elizabeth Cummings immensely for her mastering of the colour, her way to introduce the unexpected colour that makes the work sing. She abstracts the landscape yet transcribes its complexity perfectly and the result are works that you cannot grow tired of. More recently, I have discovered John Bokor and Rachel Ellis. Bokor in particular has a freshness and looseness of mark that I really love, and I admire Rachel’s work for its quietness, its tranquillity, in a way something that relates to Beckett’s work. I am getting ready for a painting residency that I will take in spring, in Tamworth area. I am looking forward to a full time immersion in the landscape, both for the effect it will have on my art but also for the mental isolation it will bring me. IN CONCLUSION WHY THE LANDSCAPE? I think the landscape is what makes me feel most alive and mortal simultaneously. It brings in me melancholia, despair, regret, but also admiration, awe, relief. The intensity of these feeling cannot be matched in any other way. … except maybe when I look at my own children. hmmmm…. That is interesting. I had never made that connection. … same range of emotions….Except that I find it very difficult to paint them.